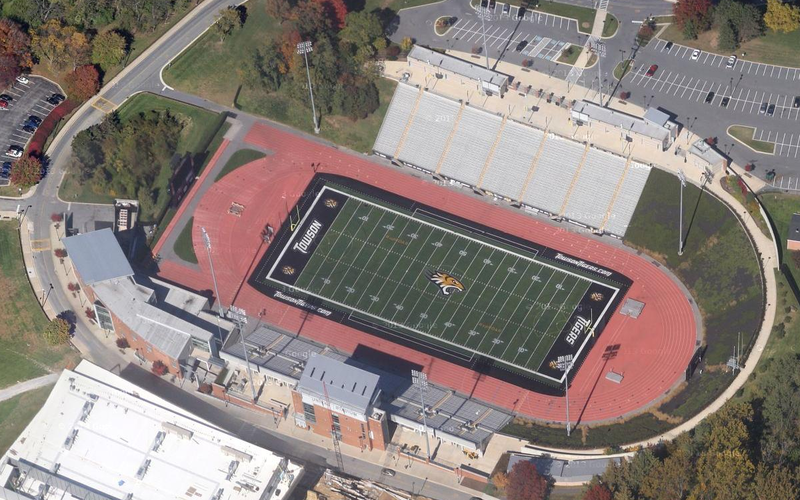 The next track in this Colonial Athletic Association series is found at Johnny Unitas Stadium, on the campus of Towson University. The Tigers women’s track & field team shares this facility with the football, lacrosse and field hockey teams. This looks like a great facility, with minimal infield space taken up by the artificial turf that was installed in 2012, so there is a great deal of track surface area. A major renovation was completed in 2002, at a cost of $32 million. There is seating for just over 11,000 people. The track and field are down in a bowl, so the athletes get some protection from the wind here, which is nice. The Towson Invitational, held on March 29, was the Tigers only home meet this year. You can watch some video highlights of the meet HERE.